[et_pb_section][et_pb_row][et_pb_column type="4_4"][et_pb_divider admin_label="Divider" color="#ffffff" show_divider="off" height="2" divider_style="solid" divider_position="top" hide_on_mobile="on" /][et_pb_gallery admin_label="Gallery" gallery_ids="1954,1955,1956,1957,1958,1959,1960,1961,1962,1963,1964,1965,1966,1967,1968" fullwidth="on" show_title_and_caption="off" show_pagination="off" background_layout="dark" auto="off" caption_all_caps="off" use_border_color="off" border_color="#ffffff" border_style="solid" hover_overlay_color="rgba(255,255,255,0.9)" /][et_pb_text admin_label="Text" background_layout="light" text_orientation="left" text_line_height="2em" use_border_color="off" border_color="#ffffff" border_style="solid"] Chris DeLorenzo is an early riser. With projected swell, he’s up by four and at the beach by six. The half-hour drive to his secret spot in north Malibu is pitch black, and he likes to arrive as the sun rises. “The problem with California,” he says, “is that there are these trade winds that come around noon. You have to hit it early.” While the company he keeps on these mornings is local surfers, many of whom DeLorenzo calls friends, he’s more or less ditched the board, favoring the tool of his chosen craft: the camera. DeLorenzo grew up in New Jersey, where he was first introduced to surfing. Though the Garden State isn’t typically associated with great surf, it does exist there. “Most people just don’t believe it, but it gets really good in the winter,” DeLorenzo says. Already DeLorenzo’s work has caught the interest of the creative digital community with interviews on Whisper Editions, The Cult Collective and Wes Jones Co. He has worked alongside renowned surf photographer Steven Lippman, and he often shoots on commission for Racer Magazine, following rally racer Ryan Millen. Though still young, DeLorenzo has the portfolio of a budding photographer who’s put in some serious hours behind the lens. “I didn’t always know I wanted to be a photographer, but I knew I wanted to create things,” says DeLorenzo. 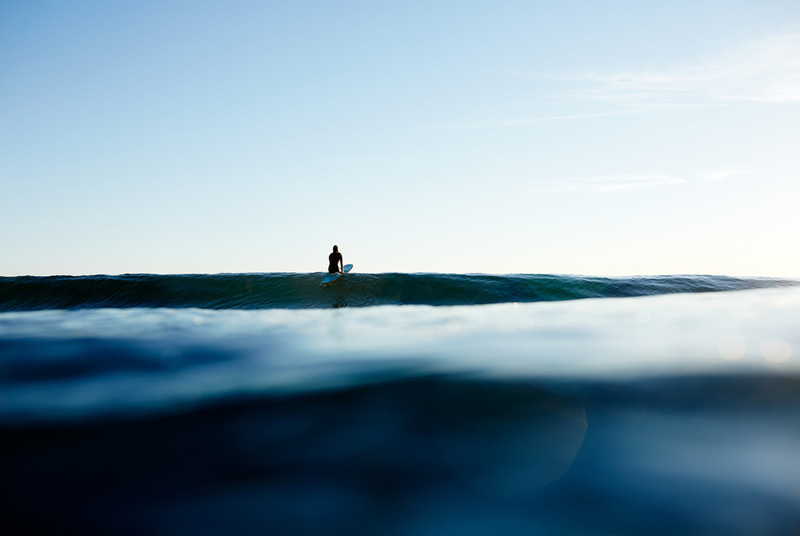 As an action sport, surfing intrinsically creates “beautiful moments to capture,” he says. “I’m drawn to creating images that are visually interesting, visually stunning.” But despite the recurring motif of surfing in his photographs (when not surfers, his subjects are often board shapers), DeLorenzo prefers to describe himself as “water photographer”. His series entitled “Immerse” — a collection of abstract images of water in different forms and colors — is the culmination of his collective experiences and his aesthetic interests. Chris DeLorenzo is a commercial photographer based in Los Angeles. To view more of his work, visit chrisdelorenzophoto.com or follow him on Instagram at @chris_delorenzo.